Buying a new computer (and I mean PCs, laptops) can be confusing. There are just so many variations these days and you may be tempted to go for the cheapest and be done with it. I will be frank you with you, because this is important. Don’t do it! Buying a new computer is confusing, but that doesn’t mean you should gloss over the details. If you buy the wrong device, you may end up making an expensive mistake. 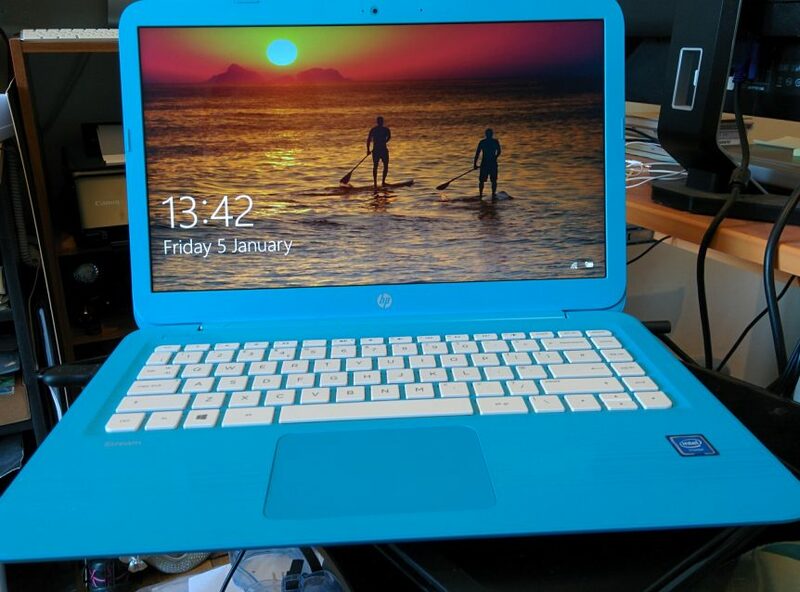 Take the HP Stream pictured as an example. It only cost around £200. It looks nice doesn’t it. Nice and shiny and new. It should be fine. Right? I was asked to have a look at it, as despite it being new it wasn’t working as the customer had thought it would. They mentioned getting a warning message about disk space running low. So after switching it on and leaving it for a couple of minutes (I went to make a cup of tea), the first thing I did was check the disk space. My mind boggled when I noticed it had zero bytes available. Zero! I looked at the disk and noticed it was a measly 27.8 GBs in capacity. That is woefully low for a Windows computer. Especially as it came with third party software installed (antivirus, productivity software, etc.). The disk space issue was then compounded by two things. Firstly it was set up to connect to cloud storage, which ate up whatever remaining space there had been as soon as it started to synchronise (and it wasn’t even anything out of the ordinary, just Word documents and the like). Secondly Windows 10 downloads and installs apps on its own (games and such) even if you don’t want them. That all uses up space and when space is tight, it becomes a real headache. To drive the nail firmly into the lid of the coffin, the laptop’s disk space wasn’t upgradeable. The only thing you can really do in a situation like that is get a refund and buy something else. To help you make the right purchase, here are a few things you should keep in mind while making that all important decision. Does the computer have enough disk space? A Chromebook can get away with a small amount of disk space (a 32GB disk is usually plenty), because everything works via web apps. Meaning there isn’t really that much installed on the device itself. Windows is a different story altogether and it is worth spending a little more to get something with a reasonable amount of space. Remember also that all computers need a bit of free disk space in order to run properly. So if you know you are going to install an office suite, or that you take a lot of photos or anything that requires huge amounts of space, make sure you take that into account. Disk space is relatively cheap these days and it is quite common to find PCs with 1 TB (terabyte) of storage for not much cost. Does the computer have a good enough processor? There is nothing more irritating than buying a new computer only to find that it runs slowly. A lot of cheap computers are cheap because they use ‘budget’ components. This includes the processor that does all the hard work. If you are tempted by a computer with a Celeron, Pentium or similarly priced budget processor, don’t be surprised if you are left waiting for things to happen whenever you switch it on or have more than one program open at a time. As a general rule, the more cores a processor has the better. Multiple cores means processors can run multiple tasks simultaneously more easily. Does the computer have enough RAM? Like the issue with disk space, RAM is also dependant on which operating system the new computer has. Again Chromebooks don’t need quite as much as other machines, because as everything is done in the browser, they don’t need to do as much processing. Other computers need more and the more you can get the better. To explain how it works here is an analogy. A processor is like the human brain, while RAM is like your short term memory. A hard disk is like a book where you store things for future use, but don’t need it right away. The larger your short term memory or RAM, the more quickly you can do complex things. If you don’t have enough, you will need to keep referring to that book or disk. This is probably the most important point, because if you buy something that is easy to upgrade, then it will last you a long time. I will give you my own computer as an example. It’s 11 years old and still going strong. I have replaced or upgraded the RAM, the processor, the hard disk, the graphics card and the power supply. In fact pretty much the only things that are still the originals are the case and the motherboard. Laptops aren’t as upgradeable as desktop computers, but you can usually upgrade the RAM, or replace the hard disk for something bigger. Remember to check this before making that purchase. Is the computer made with good quality components? The cheaper the computer, the cheaper the components. It really is that simple. Cheap components may (and I stress the word may) be fine, but are more likely to fail at some point. This is of course a tricky one to find the answers to, because you can’t very easily walk into your local computer shop and ask the retailer all about the components inside. They just won’t have that level of knowledge. As a general rule though, the old adage still holds true. You get what you pay for. I’d like to leave you with something to ponder. We are happy to spend many thousands of pounds on a new car, which sits idle doing nothing for 90% of the time. When it comes to buying a new computer which will see a lot of use (mine has been on all day every day for the last 11 years), people balk at spending more than a couple of hundred quid. Both are essential tools, but even a top of the range computer will be a fraction of the cost of a new car and it will almost certainly be used more. I guess the real question you need to ask when buying a new computer is this, how much is it worth to you?